Tag-Archive for "Plantation Original Dark Rum"
With the recent-ish move of Bartender Jamie Kimber from Trailer Happiness to Kanaloa Tropical Island Bar & Grill, has come the very pleasent surprise of another London based Rum Club. Aimed slightly more at the regular City of London’s Tiki Bar loving consumer crowd, as well as the Rum Club faithful, this newest edition to London’s drinking scene is intended to be held every two weeks and future evenings have already been lined up to feature Gosling’s Rum and El Dorado Rum, among others. Maybe for some, the 13th July 2011 might be an unlucky day, but not for those of us fortunate enough to attend the inaugural Kanaloa Rum Club with Plantation Rum. Hosted by the excellent Paul McFadyen of Bibendum Spirits, the UK distributor of Plantation Rum, it also included the special guest speaker of Alexandre Gabriel, the head of Cognac Ferrand and the man behind Plantation Rum. 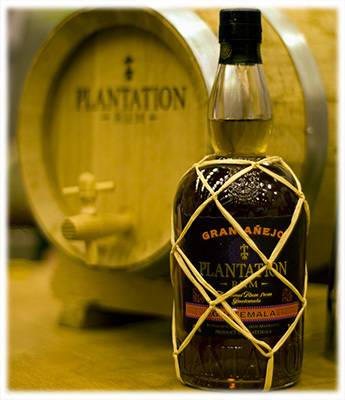 Plantation Rum is the brainchild of Alexandre Gabriel’s Cognac Ferrand, where they combine a number of the finest Caribbean rums with a double aging process in the cellars of Cognac Ferrand’s Château de Bonbonnet in France. The range includes a number of blended rums, namely: Plantation 20th Anniversary Extra Old Rum, Plantation Gran Añejo Rum (pictured right), Plantation Grande Reserve Rum, Plantation Original Dark Rum and Plantation Original Dark Overproof Rum, as well as the Single island Vintages: Plantation Barbados 2000 Rum, Plantation Grenada 1998 Rum, Plantation Guyana 1999 Rum, Plantation Jamaica 2000 Rum, Plantation Nicaragua 1998 Rum, Plantation Panama 2000 Rum, Plantation St Lucia 2001 Rum and Plantation Trinidad 2000 Rum. Along with the attendance of Alexandre Gabriel, highlights of the evening included the Plantation Rum based Rum Punch, tastings of several Plantation Rums including the newly introduced and incredibly smooth Plantation Gran Añejo Rum from Guatemala, along with Jamie’s experimentation in Tiki Cocktails using Plantation Rum. Unfortuantely, due to other commitments a full update of the evening isn’t possible, having left at the start of the main presentation. 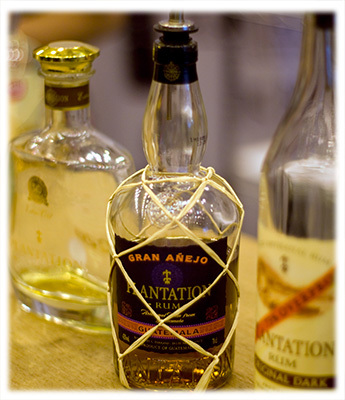 Although this meant missing out on the evening’s full tasting, I can confirm from previous tasting sessions that the range of Planation Rum includes some of the finest examples of quality rum and no decent rum collection should be without at least one or two bottles from the range of Plantation Rum. So my thanks to Jamie, Alexandre, Paul and rest of the Plantation/Bibendum team for a great evening and I look forward to many future evenings at the Kanaloa Rum Club, including the 25th July 2011 when it plays host to Gosling’s Rum. For further details about the Kanaloa Rum club, please email TheRumClub@Hotmail.co.uk or ask for Jamie at the bar.